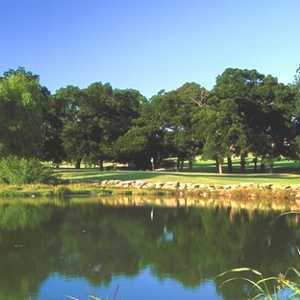 FORT WORTH, TX -- The Creeks at Beechwood is tighter than a camel's rear in a sandstorm. Want a challenge? Do you like golf holes that are long and narrow? How about arriving at your ball in the middle of the fairway and there's a tree in your line to the green? Will The Creeks frustrate you on your first visit? Was it David Feherty who said: "I feel like I was led into a circular room and told to go stand in the corner?" "I didn't mind at all that it is a very tough golf course," said Joe Toeniskoetter of Flower Mound. His friend Matt Pohl echoed the thought. "It was pretty much a target layout, but very unique. It reminded me a lot of Fazio Foothills at Barton Creek in Austin." "The Creeks certainly doesn't reward you for being aggressive," said Pohl. "I really enjoyed the different characteristics the course has. I can imagine in July and August when the wind is blowing and the ground is hard, just how tough it will be." That's just what head pro Jim Osborne has visualized. "When the course matures a little more we won't be cutting the rough as close as we are now," Osborne said. "And the GN-1 bermuda fairways will get quick. It will make most holes a little more difficult, but some easier. Right now that one-inch rough collar is playable. Eventually, I see the ability to putt from 30 to 40 yards off the green or play a bump-and-run -- or you can play a high ball." 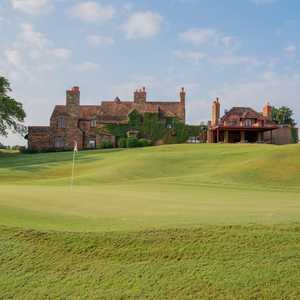 Designer Greg Norman, who has authored only one other course in Texas, Meadowbrook Farms Golf Club in Katy, envisioned a theme maximizing the land's natural features and he minimized dramatic changes to topography. Norman's design philosophy plots the course along a creek leading though thick stands of oak and pecan trees and he lets it hug the contours of the land. Norman put in fewer than 40 bunkers and built massive, gently sloping greens. "Instead of building up the greens, he cut them out of the natural hollows," Osborne said. "Our greens are Tif Eagle and can get really quick." You will also face white Floridian sand bunkers, huge waste areas, ponds and discover that the tricky layout is meshed with the creeks on holes 16 to 17. No. 17 is a puzzle-board of ditches filled with running water. You can carry one section of crossing water only to bounce into a sideboard of wetness. So The Creeks at Beechwood, a Troon Golf-managed property, was built into a former cattle ranch, nestled into some creek beds with high walls and distinctive rock outcroppings. It stretches 7,150 yards, a par 72, with five sets of tees. If you are smart you will pick a tee box one up from your normal distance on your first trip to this bedeviling layout. Blind Man's Bluff may be the most interesting hole on the course. It's 406 yards suited for Stevie Wonder's game. First you drive up and over "the bluff", aiming at the dead "hangman's tree" to a spot you can't see. You need to draw it. Then the second shot is down over another bluff. There's a small target of fairway straight ahead, but those taking a direct route to the green situated off to the left, will be clearing non-fairway rocky terrain and the creek. You basically hit from the creek bottom up to a plateaued fairway, go left, and end up back down in the creek bed. "This is one of those holes where you don't have a clue the first time you play it," said Pohl. "Even with the yardage book it is hard to imagine. It's one of the most unique holes I've ever seen." The toughest hole? That's probably "Great White" No. 11, a 486-yard par-4. It's a tough driving hole because the fairway makes a wiggle left to right. Too far left is dead, but if you can fade it over trouble right, you will have the best approach to this long and narrow green that is guarded left by a huge waste area that funnels into a lake. Two short holes that are fun and testy are No. 1 and No. 10. The first, "Little Bear", is only 396, but the fairway shrinks to nothing near the hole with big oaks left and jungle right. The 11th, Mako Shark, is only 303 yards, but visually intimidating. There's a creek carry, which extends right in front of you and continues down the left side. It's narrow and there's lots of trouble right. But if you hit it down the middle you have a birdie chance. This is a golf course that's as handsome as Mr. Universe for the most part. All the holes are interesting, but the attractiveness of the land from No. 15 to 18 resembles a 90-pound weakling. That's the only negative to this tract. But these holes are interesting, just not scenic. The must-play layout is the centerpiece of the Beechwood Business Park, a 902-acre master-planned office and resort development in the rolling countryside just north of Fort Worth. A 286-room Westin Hotel will be opened about October 2001, and eventually it will grow to 500 rooms with a full-service spa. Another unique feature of The Creeks at Beechwood is that its next-door neighbor is The Texas Motor Speedway. "We absolutely want to have major competitions here in the future," said Osborne. "We envision a 2-day pro-am for the racing competitors during that October time frame when the have the major race. We'd love to get some Senior PGA events, get some TV exposure and feedback from some of the game's top players. Who knows?" Directions: Located on the southwest corner of I-35W and Highway 114 next to the Texas Motor Speedway. From Fort Worth on I-35, take Highway 114 left or west. One mile to turnoff on left. Just twenty minutes west of the D-FW airport in North Fort Worth. Things To Do In Cowtown: Even Yankees are welcome at the Fort Worth Stockyards, a National Historic landmark. Check out: http://www.fortworthstockyards.org. In 1849 Major Ripley Arnold and a troop of soldiers were ordered to set up Fort Worth and protect the settlers in North Texas. By 1853, the frontier moved west and the fort that was abandoned by the Army became Fort Worth. By 1856 the citizens stole the county records from Birdville and won the county seat. Soon Fort Worth became a frequent stop for cattlemen herding through the area. Early settlers say wild longhorns that roamed the open range were free for the taking. Cowboys herded them up, branded them, and drove them north for a Texas-sized profits. By 1866, the city had earned its reputation as "Cowtown," and was in the middle of the Chisholm Trail. Great Cowboy Grub: Riscky's BBQ, Yum, yum. You can find the descendants of those early cattle drives on your plate right here at 120 East Exchange Avenue, Fort Worth. Call 817-624-4800. Or visit: http://www.risckys.com. The Creeks at Beechwood Land's History: Old timers tell a story, says Osborne, of the outlaw Sam Bass, who staged a hold-up of The Burlington-Santa Fe railroad, which runs by on the western edge of The Creeks at Beechwood's property line. The legend says his gang purloined a cargo of gold bars near the turn of the century. The story also alleges that some of the gang buried gold bars on the property. So in 1945 a Mr. J. Cleo Thompson, owner of the property, was asked by a former Huntsville jailbird, and Bass accomplice, if he could search the property for the gold. The former prisoner was in his 80s, but came back numerous times searching. Developers named No. 6, the par-3 hole, "Fool's Gold", because that's the area the gold was supposed to be. No. 7 is named "Outlaw". The second hole, the 594-yard monster that's as narrow as a bowling lane, is named "Big Daddy," in honor of Dallas oilman Jimmy "Big Daddy" Thompson. Current landowner Frank Harrison III of Dallas, penned that hole name. According to Osborne, Thompson sold the land to Harrison for the development of the golf course after owning the land since the 1940s. Being from Highland Park and an SMU Mustang, Harrison invited SMU athletes to the land for BBQs and camp outs. A pit grill, built for these outings, still stands in sight from the No. 4 tee.